What Wii consoles can play GameCube games? I hear the newer ones do not play GCN games. How can one distinguish these consoles? (Date of manufacture? Console color? Bundled games? GameCube controller port panel? Something else?) For instance, what questions would I need to ask an eBay or Craigslist seller if the seller didn't have GCN games to try? 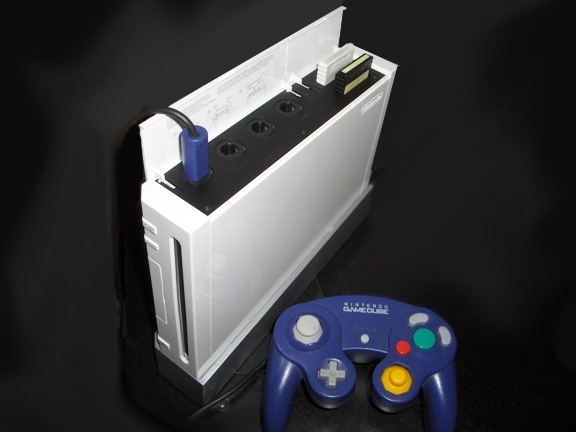 The original Wii supports GameCube games on disc, and has GameCube controller ports hidden under a plastic door. The best way to tell them apart is the model number - the Family Edition is model number RVL-101, and the "classic" Wii is model number RVL-001. This number is printed on a label on the bottom of the unit when it is in the vertical orientation. If it's lying horizontally, this label is on the right side of the unit when looking at the front. You can confirm this information on Nintendo's support website. Click to view the Wii manuals, and you'll see two sets, one for the RVL-001, and one for the RVL-101. The 001 manual mentions the GameCube ports, while the 101 does not. The plastic panel covering the GameCube ports on the Family Edition is screwed down, where on the older model it flipped open. Underneath, the holes are present for the controller ports, but the ports themselves are empty. The serial numbers on the "classic" Wii tend to start with L, and the Family Edition serial numbers appear to start with K. However, since serial numbers are at the discretion of the manufacturer, I'd hesitate to act on that information alone. The Family Edition Wii doesn't ship with the vertical stand, although since the case design is identical to the previous design it can be used horizontally or vertically. The Family Editon's Wii logo is parallel to the disc drive slot, (making it correctly oriented when the unit is horizontal) whereas it was perpendicular to the drive slot on the original Wii. Since introducing the Family edition, Nintendo has also released the Wii Mini in some markets, which does not support GameCube games at all. It is also missing network support, and has a top-loading disc drive rather than the front-loading drive of the original Wii design. It is essentially a bare-bones, stripped down version of the original Wii. 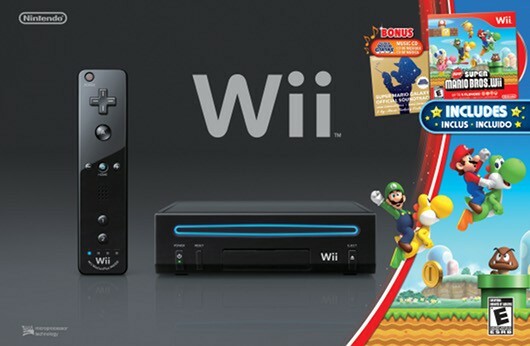 The new iteration of Nintendo gaming hardware is called the Wii U. Despite similar names, and cross-compatibility with certain Wii peripherals, the new Wii U does not support GameCube discs either. ...newly configured black Wii console sits horizontally rather than vertically. You might gain some confidence by checking for serial numbers mentioned in this article. Since those are older consoles that predate the shift to dropping GameCube support. However, the best idea is to just get a picture of the GameCube controller ports. If it has ports, it has GameCube support. There's a way to put Gamecube ports back on the Wii Family Edition. 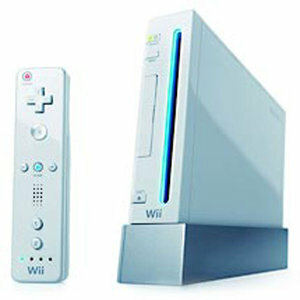 You can switch the parts around so the Wii Family Edition will play Gamecube games and the original Wii can't. This is the only way to play Gamecube games on the new Wii. You should do this at your own risk. According to Nintendo, any Wii unit with a product code beginning with RVL supports GameCube software and accessories. Any Wii unit that has a product code beginning with RVK does not. This may only be true for UK consoles. Wii Family Edition can't play GCN games, but the old ones can. Not the answer you're looking for? Browse other questions tagged nintendo-wii nintendo-gamecube or ask your own question. Which controllers do I need for playing GameCube and N64 games on a Wii? What's the Family Trainer Dancing Mat Controller for? What do you need to play gamecube games on your wii? How can I start a GameCube game without using a Wii Remote? Can you save GameCube games on the Wii U? Do Gamecube games on the Wii use the Wii's system clock? What's the difference between playing a GameCube game on a GameCube and a Wii?